Elizabeth Miu-Lan Young co-founded InterChange Consultants in 1987. She is a specialist in cultural competencies training focusing on Asian issues at work. She has been active in the New York City Asian Community for the past 40 years. 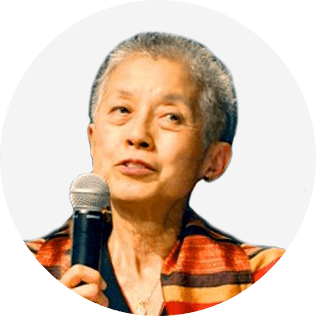 One of the founders of the Charles B. Wang Community Health Center in NYC (formerly the Chinatown Health Clinic), she also taught the pilot Asian American Experience course at Hunter College and the University of Southern California. Liz served as the first Director of Project Reach – a Chinese-American Planning Council program working with Chinatown street gangs. She also worked in a garment sweatshop to better understand the immigrant experience. She was a senior research associate with an Affirmative Action consulting firm headed by Dr. Kenneth Clark. She has also trained administrators, faculty and students in cultural competencies at Fashion Institute of Technology, Harvard, Yale, Columbia, New York University, Spelman, Princeton, the University of Connecticut, Brown University, Columbia University School of International and Public Affairs and new medical/dental students at Stony Brook University School of Medicine. For the NCAA, Liz has co-facilitated the weeklong Leadership Intensive for the Leadership Institute for Ethnic Minorities and Division III’s groundbreaking Ethnic Minority and Women’s Internship Program joint orientation for interns, their supervisors and mentors. She also serves as a staff developer with the Morningside Center for Teaching Social Responsibility, coaching public school teachers committed to teaching Social and Emotional Intelligence skills to their students. She is a graduate of the University of California at Berkeley and has received extensive training in Organizational Development.